CALL THE TEAM FOR YOUR FREE QUOTE! We are the Auckland area house wash experts, with over 33 years experience! As one of the leading house wash companies in Auckland and with over 33 plus years experience in the industry, DNA Housewash’s focus on providing our customers with professional, quality solutions at affordable prices. Find out more about what we can help you with below. …get rid of that winter dirt and grime and make your house look clean again. …in areas prone to heavy leaf fall we recommend an effective, continuous gutter protection system for your home. …paths can become dangerous, let us clean and restore them for you. …ensure your roof stays in good condition to eliminate expensive maintenance costs! …we use both low and medium pressure cleans to ensure no damage and a great end-result. …clean up the driveway, or make the fence look great again. …an environmentally friendly product that is highly effective against all insect life. …let us clean your gutters and protect your house from damage and leaks. …developed over many years, for the removal of moss, mould and lichen. Your FREE NO OBLIGATION QUOTE. When you’re looking for house-wash contractors in Auckland who won’t break the bank, DNA Housewash is who you need. Organise a quote for your home or commercial building. And remember – no job is too small for our team of skilled staff. Auckland's Leading House Cleaning Company. 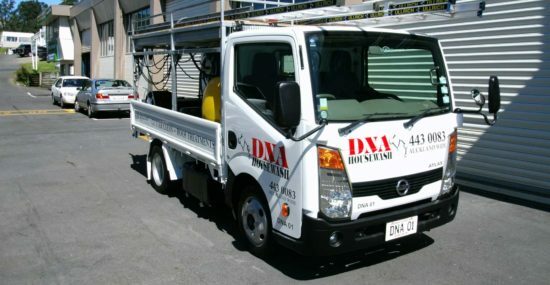 DNA Housewash is a privately owned, well established Auckland company with its head office based on Auckland’s North Shore. With over 33 plus years of experience, our focus is on customer service and quality work with a full guarantee on our workmanship, we simply take pride in our work. At DNA Housewash, we aim to be the experts you trust when your house needs cleaning. As one of the premier house-wash companies in the local area, we offer superior workmanship for domestic, commercial and industrial clients. Specialising in house soft-wash and grime removal, roof wash and roof treatments, gutter cleaning and unblocking, spider and whitetail treatments, gutter guard installation, cleaning slippery decks, paths and steps, washing and treating paving, driveways and fences, pre-paint preparation, moss, mould & lichen treatments… so whatever you need, we have it covered. There are many other contractors in Auckland, but none have the customer centric focus and results driven attitude that we do. Our team of fully qualified and highly experienced staff will provide you the expert advice you need to get the right solution to fit your needs. Whether you call us for a house-wash or simply require roof cleaning for your existing structure, we aim to offer you the most affordable price without compromising on the quality of the finish. This commitment to achieving the most exceptional results for all of our customers is what has made us the company of choice for so many people in the area. Ensuring that your house and surrounding areas are in tip-top condition which make’s your property more visually appealing and can save you thousands in maintenance costs in the long run. Work with a company who understands the financial and emotional value home-owners attach to their property. At DNA Housewash, we take the greatest care to ensure that each job is completed to the highest standards. All our staff are highly-trained and know the best options for you. We use only the best custom built equipment available, which eliminates or minimizes down-time and ensures no disruptions for you. So your project is done right, on-time and on-budget. We carry full public liability insurance for your ultimate protection while on site. We know your time is precious, so our teams are on-time, everytime. DNA Housewash are committed to the integration of health and safety programs and practices to provide a safe work environment for employees, contractors and your site. Most of the cleaning products used by DNA Housewash are bio-degradable and environmentally friendly. Our Citrus soft-wash being the most popular. So take your time to read our testimonials, from our raving fans. DNA Housewash Limited, PO Box 334 047, Sunnynook, 0743, AUCKLAND. DNA Housewash operates from Orewa to Papakura, and throughout all suburbs of Auckland. To obtain your no obligation, free quote please complete the following form. let us know a bit about your project. WE LOVE WHAT WE DO, IT’S THAT SIMPLE. We've been doing it for over 33 plus years, we love to help you save time. From a quick wash of your deck, to a full commercial project, a fence clean right the way through to a full wash-down of an existing house exterior – our highly trained teams can take care of it all. PRODUCT DEVELOPMENT & LOCAL SUPPORT. DNA Housewash Ltd uses some the worlds leading surface cleaning products. You can find our amazing work all Auckland and every client benefits from over 33 plus years local R&D. We know what works, and where it works. Copyright © DNA Housewash Limited 2019, All Rights reserved.